A new take on the classic quesadilla. 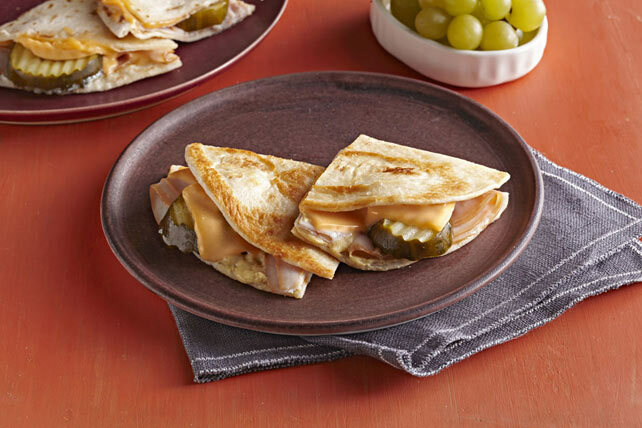 Spread 1 tortilla with mustard; top with turkey, pickles and Kraft Singles. Cover with second tortilla. Melt margarine in medium skillet on medium heat. Add quesadilla; cook 2 min. on each side or until Singles are melted and quesadilla is lightly browned on both sides. Serve with a mixed green salad and glass of cold milk to round out the meal. Prepare using whole wheat tortillas.